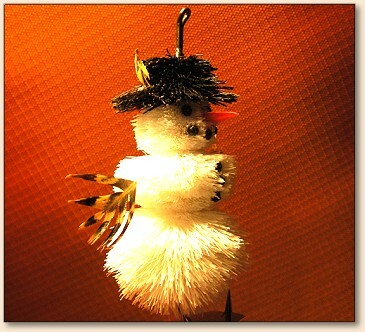 "Christmas Snowman - #292 FAOL"
Winter in Montana makes you do strange things like tying this fly. 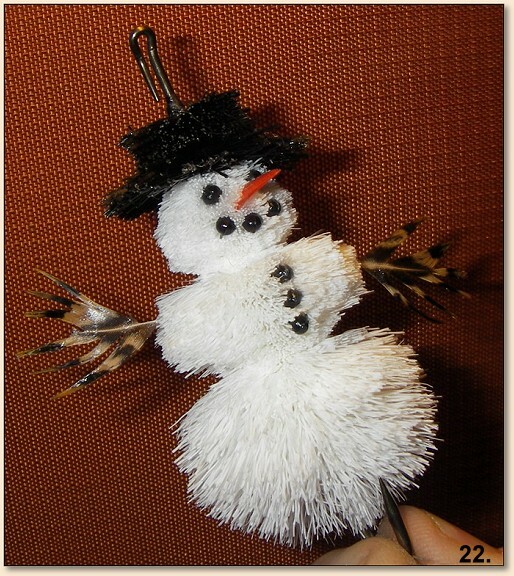 Scott came up with it on a snowy night last winter and it's been a local sensation ever since. 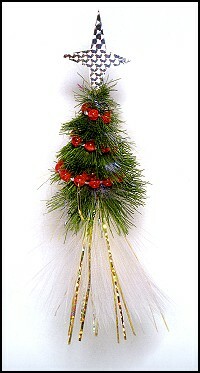 You can practice spinning deer hair and make Christmas presents at the same time. 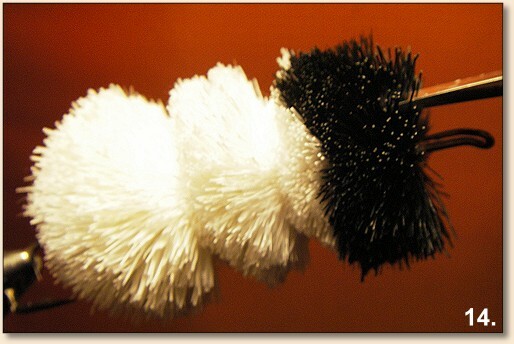 It has proven itself a great fly for housecats and small children so you might want to pinch down that barb or consider gluing something over it to prevent a holiday disaster, like a small bead. Merry Christmas. 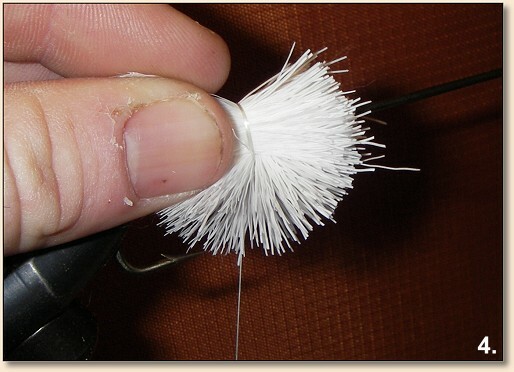 Hook: Carrie Stevens Streamer CS15. 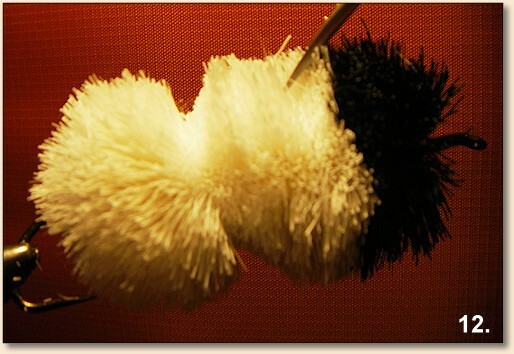 Body: Bleached Dyed White Deer Belly Hair. Hat: Black Deer Belly Hair. 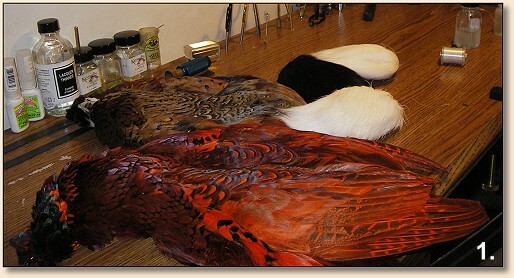 Nose: Dyed Orange Pheasant Body Feather. 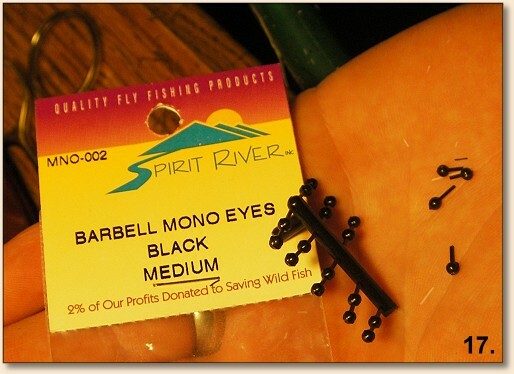 Eyes and Buttons: Spirit River Plastic Eyes. 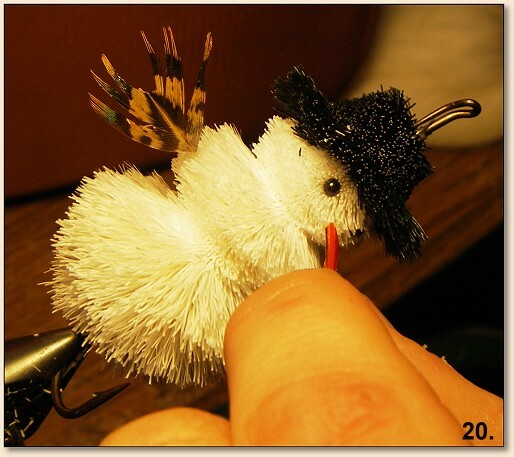 Feather for hat: Pheasant Body. 1. 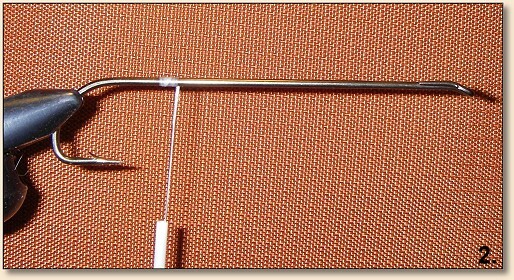 Place hook in vice as shown (placing close to the shank keeps it from bending too much while spinning). Start thread. 2. 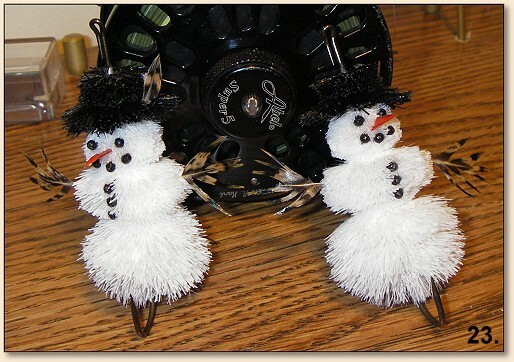 Spin a generous clump of deer hair on the bottom of the hook and then another on top. One trick that you should try is to cut the tips of the deer hair off before spinning, this makes things a lot easier in the long run. 3. 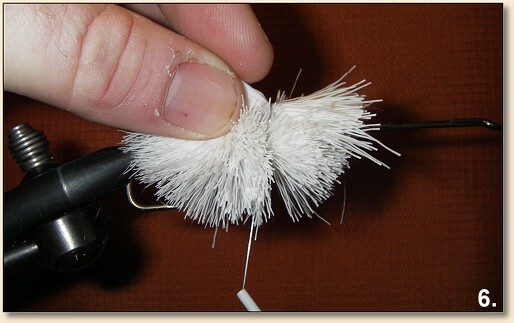 Continue spinning and packing white deer hair about 5/8 of the way towards the eye of the hook. 4. 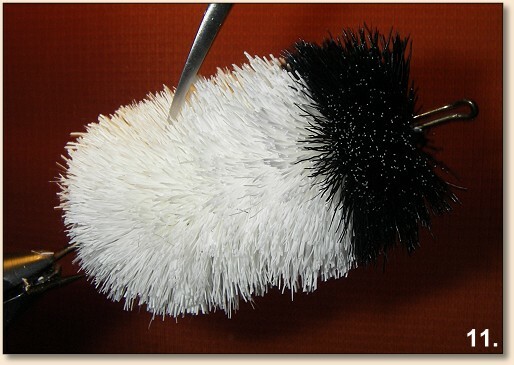 Cut and clean some black deer hair and pack about 4 more clumps, each a bit bigger than the diameter of a pencil. 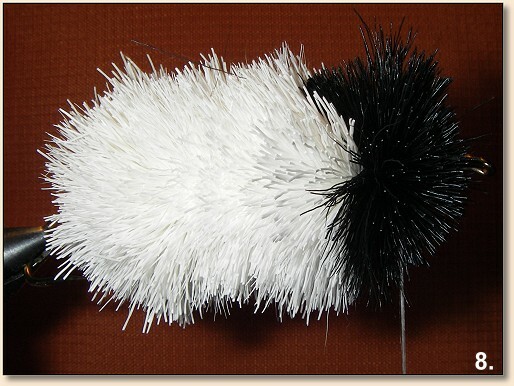 Try to keep the black from intermingling with the white. 5. 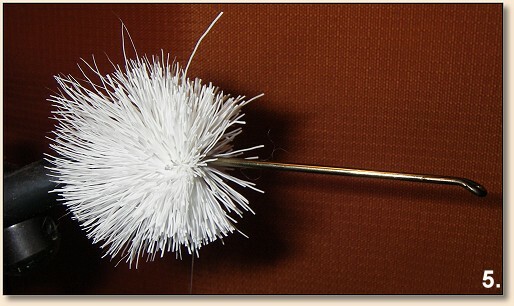 Whip finish at the head and you should have a great big mess that looks something like this. 6. Cut off all the stragglers and using a razor blade make the whole thing shaped like a tube. Scott did this on my non-rotary vice and admitted that it was way easier on a rotary. Scott prefers scissors for this job but a razor blade would also do nicely. 7. Round off the bottom. 8. 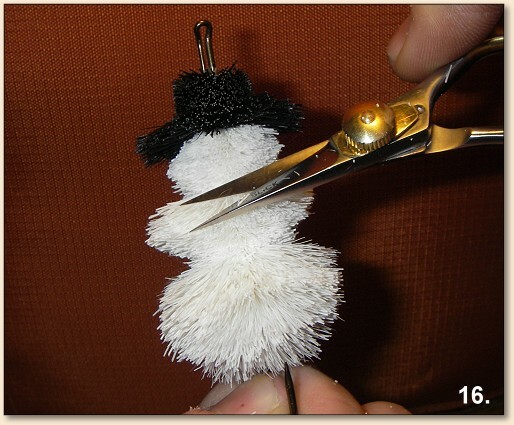 Slide the scissors in at an angle so that the tips are right in between the segments of the snowman. 9. Round off the edges. 10. Make the brim of the hat as large as you would like it and round it. 11. Slide scissors in to thin the brim. 12. Again, slide your scissors in to round the head. Things are starting to take shape. 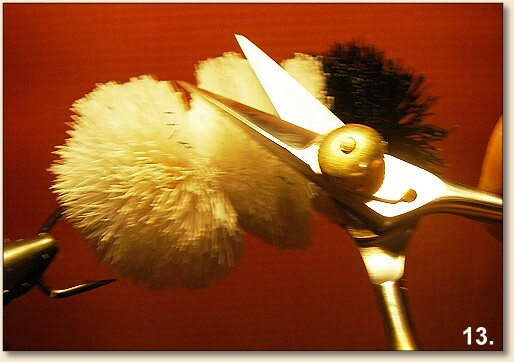 Don't worry that it's not perfect; you can take the scissors to it later and polish it up. 13. 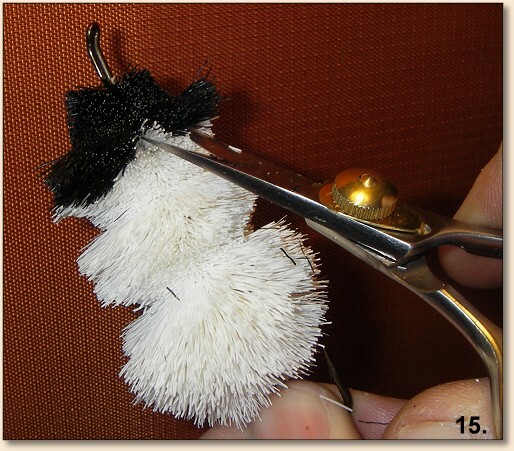 Take the fly out of the vice and trim all the straggling hairs to make it look smooth and well rounded. 14. Cut the barbell mono eyes as shown. Hold with tweezers and slide in place. Put a drop of ZapAGap on each. 15. For the hands use a pheasant back feather. 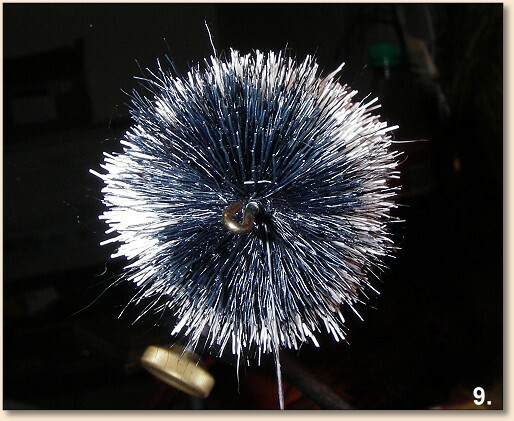 Strip part of the quill. 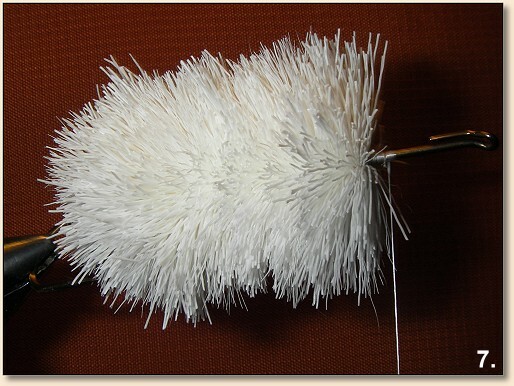 Coat it with flexament and tweak it to the desired shape. Here Scott tries to simulate a tree branch. Slide it into place and apply ZapAGap. 16. 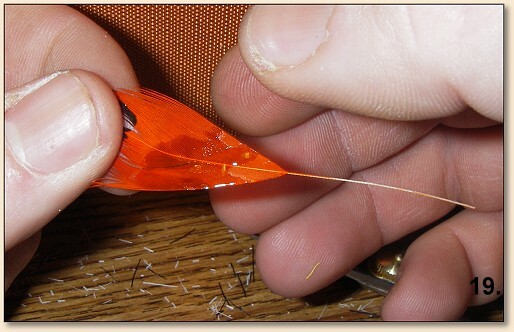 For the nose, take a dyed orange pheasant body feather and fold it back using the wonderwing technique. Set it in place by hand and apply some ZapAGap. 17. 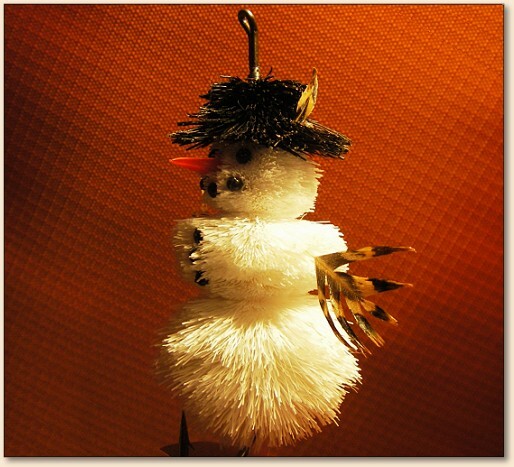 A snowman isn't complete without a feather in his hat. 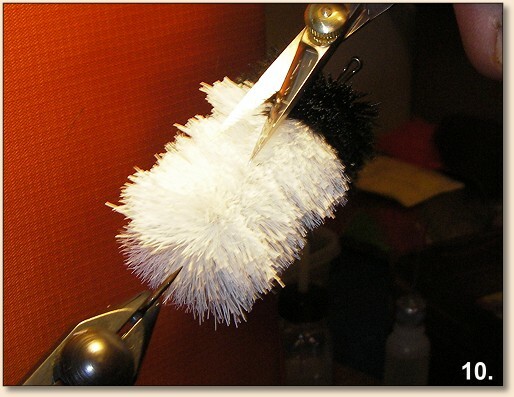 Here Scott has coated a pheasant body feather with flexament and set in place with ZapAGap. Any small feather or biot would work for this. Now sit back and enjoy a Christmas beverage. 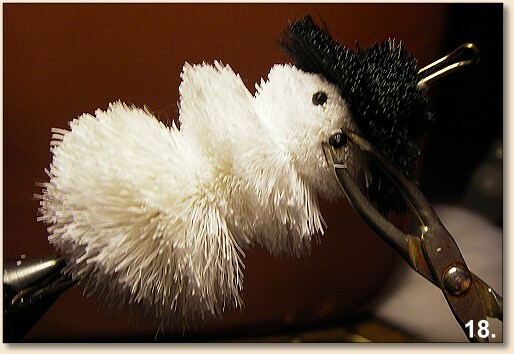 If you tied this fly, you earned it.